Beside NUCs and Mac minis there is another great barebone in the homelab market. Basic requirements for home server are a decent price, good performance and low power consumption. Gigabytes BRIX offers great performance and is small in size and power consumption and thus makes it a great candidate for running ESXi at home. To get started, first a look at the different models available at the moment. BRIX: Basic Barebone, candidate for ESXi. BRIX s: Identical to BRIX barebones but with 2.5" HDD/SDD support. Slightly larger case and a good candidate for ESXi. BRIX Pro: High performance BRIX with 2.5" HDD/SDD support and quad-core CPU. These are the only systems with VT-d support and thus the best candidate for ESXi. There is also a Brix Gaming series with GPU support and a BRIX Projector with an integrated projector. BRIX with AMD and Celeron CPUs are also available but these are not the best candidates for ESXi. I'm listing them here for completeness. Best candidates for ESXi are BRIX, BRIX s and BRIX Pro. I am not looking further into other models. All listed BRIX systems have hardware support for virtualization and a 64-bit capable CPU. Therefore it should be compatible to VMware ESXi. 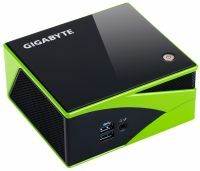 Gigabyte BRIX Pro barebones have Intel VT-d support which makes the system better and installation easier. To clarify, the system is not supported by VMware (Not listed in HCL), so do not use this system in a productive environment. I can not guarantee that it will work stable. As a home lab, or a small home server it should be fine. SATA and Network drivers are not included in the ESXi Base Image, so you have to create a customized image. This is a very easy step, everyone can do it at home in 10 minutes. Use the following commands to create a customized ESXi Image for you BRIX. This will download all required files (about 300MB) and create a bootable ISO file. If you want to use another ESXi version than ESXi 5.5 February Patch 2015, select another Image Profile. A list of all Image Profiles is available here. New-EsxImageProfile -CloneProfile "ESXi-5.5.0-20150204001-standard" -name "ESXi-5.5.0-20150204001-BRIX" -Vendor "virten.net"
Add-EsxSoftwarePackage -ImageProfile "ESXi-5.5.0-20150204001-BRIX" -SoftwarePackage "net-r8168"
Add-EsxSoftwarePackage -ImageProfile "ESXi-5.5.0-20150204001-BRIX" -SoftwarePackage "net-r8169"
Add-EsxSoftwarePackage -ImageProfile "ESXi-5.5.0-20150204001-BRIX" -SoftwarePackage "net-sky2"
Add-EsxSoftwarePackage -ImageProfile "ESXi-5.5.0-20150204001-BRIX" -SoftwarePackage "net-s2io"
New-EsxImageProfile -CloneProfile "ESXi-5.5.0-20150204001-standard" -name "ESXi-5.5.0-20150204001-BRIX" -Vendor "virten.net" -AcceptanceLevel "CommunitySupported"
Add-EsxSoftwarePackage -ImageProfile "ESXi-5.5.0-20150204001-BRIX" -SoftwarePackage "sata-xahci"
That's it. Please remember that step 11-14 are only required for BRIX and BRIX s.
As of now I am stuck on the PowerCLI part, on the last command it seems to hang there. How long does that command take to complete? It has to download 300mb at that point. But it shouldn't take very long. When I disable CSM in the bios that pretty much bricks my brix -_- ha. I have to unplug the battery boot up and change save back to default. Should i just got out and get an external cd drive? Hope this saves someone time and headaches.... Just setup a BRIX Pro with i7, and ESXi 5.5. Using an external CD drive (usb drive would not work), then disabling CSM, the install completes without any issues. The problem occurs following the installation of ESXi. After assigning a management IP, and restarting the network service, ESXi would not respond to pings and I could not login via vSphere. Also, after disconnecting from power, subsequent attempts to power on the BRIX failed. To fix the issue, I had to disconnect the CMOS battery to get back into the BIOS settings. I RE-enabled CSM, powered on and the BRIX has performed flawlessly since. Follow up: I "solved" my own problem. USB Cd drive is the answer. For whatever reason it doesn't want to install from the Flash drive. I tried numerous methods of putting the iso onto a flash drive to no avail. Booted up no problem on USB cd drive. No install issues beyond that! Thanks for the guide and software! No worries man, Helps me keep up on my trouble shooting skills - aka the issue is probably the simpest solution haha. Anyways, I'm very pleased. This was used to replace a dell poweredge 2950 used as a home media server - I was getting tired of the noise. With all 3 of my VMs running, the APC backup is showing ~9watts of consumption and ~186hrs on battery time! Well worththe trouble! FYI, I managed to install ESXi 6 from flash drive by selecting GPT partition scheme for UEFI computer with Brutus to make the USB bootable. ESXi 6 is not yet in the depot. You have to use the offline bundle from the Download page. Or, if you don't have a paid subscription so you can get the offline bundle (without a lot of screwing around, that is), Sign up for a trial of vSphere 6, grab the hypervisor ISO, and use ESXi Customizer to inject the drivers, which is what I did. ESXi Customizer can be found here. The 2 driver files you need to inject are here (NIC) and here (AHCI). In both cases, you want the Offline Bundle version at the bottom of the page. For an overview of how to use ESXi-Customizer, I referred to this link. It isn't specifically for the Brix, but it'll give you an idea of how to build the modified vSphere 6 ISO (note that when you get to the part where you add the drivers in ESXi-Customizer, it won't show the .zip files you downloaded until you change the file type in the open dialog to "all files"). Finally, make sure you disable CSM in the Brix's BIOS, or it'll probably hand in the middle of the install. Heh. The links are totally screwed up in my post for some reason, even though I closed my tags. Just hover over them so you can spot all the different places I mentioned. They're all there. "command line is empty. Fatal error: 32 (syntax)"
So if USB CD Driver is the only choice... is it possible to modify the shopping guide to replace the item#5 with a usb cd driver? Thanks for this page, it has helped tremendously. I have the I5-4200 BRIX S.
I can create a USB stick with ESXi 6.0 and it works fine, but 5.5 fails to boot with the “command line is empty. Fatal error: 32 (syntax)” issue. I have not tried an external CD drive yet as I don't have one. Any ideas where im going wrong ? Are you trying to do it from a flash drive? If so - I encountered numerous issues with it and it seems everyone else here had the same conclusion. You're going to need a usb cd drive. I installed with this method a few months back. Am I able to update ESXI via normal procedures or do I need to do something special? I am so frustrated and was hoping someone could help me. Does anyone know what this means? Any help would be appreciated. These message are usually caused by corrupt ISO images. Did you try to redownload and recreate everything? Also you could try PowerCLI to create the installer image. I just thought I'd leave a message here for everyone trying to get ESX 5.5 installed on a BRIX and getting either the hang at "Initializing storage stack" or the "Command line is empty. Fatal error: 32 (syntax)" error. I just bought a GB-BXi3H-4010 and was trying to install v5.5 on it from a Sandisk Fit USB drive. I did not touch anything in the BIOS and got the hang at "Initializing storage stack". So I followed the instructions in this article and went to BIOS > Boot > CSM Parameters and set "Launch CSM" to Disabled. Rebooted again and got the "Command line is empty" error. "hey,i guess you are installing esxi 5.1 with uefi boot mode .To solve this problem you have to get a esxi 6.0.iso file and extract EFI\boot\BOOTX64.EFI BOOTIA32.EFI ,then put this two files into same path in esxi 5.1.iso . it should be working now." So I downloaded the ESX 6 ISO, pulled out the two files and overwrote the existing ones on my flash drive. It booted and installed successfully! Note that I am not using the "noIOMMU" parameter, whatever this does, my install appears to be working fine without it. Brilliant post - author should update these instructions. I was having some wicked issues getting this to work. I had a 3537 that didn't need any 'magic' but the 4770 was not taking ESXi5.5 at all. Thanks Nick - nice fix there, and saves me cobbling together a USB CD that I'll use once a decade. Otherwise - a stellar article. I am still having issues with 6.0, but thats for another time. Downloading ESXi 6 ISO and extracting those files, then replacing those files on the 5.5 ISO worked to get it to boot from a flash drive and start installation of ESXi 5.5. I was able to get it installed and started without issues after that. :! : I've got a Brix Pro, but in hot weather it seems that esxi can't control the fans properly, they never ramp up to max and the machine goes into thermal shutdown. Ambient is 29 degrees C and setting the fans to max all the time in the BIOS keeps the machine running, but it's too noisy for a small office. 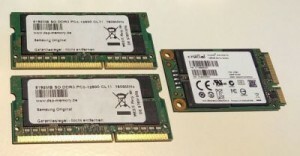 Has anyone managed to get ESXi installed on the fanless BRIX (Celeron) GB-BXBT-2807? It runs Hyper-V 2012 perfectly.. but ESX would be better due to the differences in network configuration. I have a BXi7-4770R and I followed the instructions and got esxi 5.5 installed but it will not respond to any network tests. When I look at the Network config I see the adapter and I am able to configure it. When I do a packet capture I see some arp packets come from the BRIX but when my computer responds it just asks again like it never got the response. Any ideas on what I should do next? Probably a bit late for you, but might help others. I have a BXi7-4470R with the latest BIOS. I disabled CSM (otherwise I always got the hang at "Initializing storage stack), installed a custom ESXi 5.5 with no issues (fine from CD and PXE, but gave up with USB stick), but always got this network issue. I then disabled IPv6 and all is now well. While trying to install ESXi 5.5, I am getting stuck "Initializing storage stack..." prompt. It's not moving on from here on. Any help would be highly appreciated. Fantastic! ESXi 5.5 runs perfect on my BRIX PRO now. Thank you so much for checking this out! Will it work with the GIGABYTE BRIX GB-BXi3H-5010? I've just successfully used the same process on a GB-BXi7-5775 (rev. 1.0). Does anyone know how to get the wireless adaptor working? is it possible to setup a vsan with 3 brix units? it works right out of the box w/ latest ESXi ... it detects both NICs on the latest BRIX that has dual NIC. I try installing ESXi 6.5 on a GB-BKi7HA-7500, alot of the driver is missing. Where can i get the VIB online or do you have a customise images for me to use? I did get it install on the GB-BXi5-5575R but not with 6.5. I had issues using a USB CDROM so I used a flash drive and it worked like a champ. GB-BKi5HA-7200 but it can not recognize NIC. Can you please give drivers to make customized ISO? New-EsxImageProfile -CloneProfile "ESXi-6.7.0-20181104001-standard" -name "ESXi-6.7.0-20181104001-BRIX" -Vendor "virten.net" -AcceptanceLevel "CommunitySupported"
Add-EsxSoftwarePackage -ImageProfile "ESXi-6.7.0-20181104001-BRIX" -SoftwarePackage "net55-r8168"
Add-EsxSoftwarePackage -ImageProfile "ESXi-6.7.0-20181104001-BRIX" -SoftwarePackage "net55-r8169"
Add-EsxSoftwarePackage -ImageProfile "ESXi-6.7.0-20181104001-BRIX" -SoftwarePackage "net51-drivers"
Add-EsxSoftwarePackage -ImageProfile "ESXi-6.7.0-20181104001-BRIX" -SoftwarePackage "net-sky2-1"
Add-EsxSoftwarePackage -ImageProfile "ESXi-6.7.0-20181104001-BRIX" -SoftwarePackage "sata-xahci"
So I was able to get 6.0 booted from a usb drive on my GB-BXi7-4770R. Unfortunately when I try to choose a storage device it does not show anything at all.